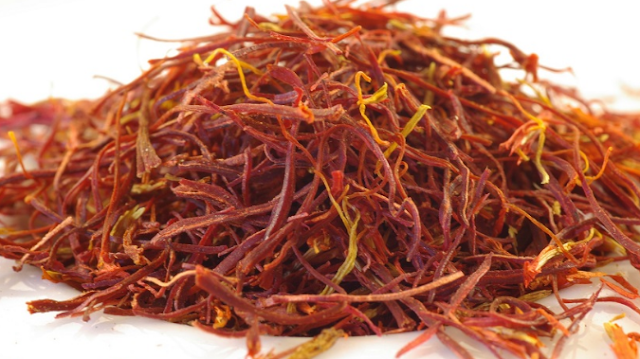 Saffron is recommended for achieving radiant skin. Use saffron in combination with any of your favourite homemade face pack to gain super rich, smooth skin. To improve your skin’s texture just boil ½ cup of water for 10 minutes. To it add 4 to 5 strands of saffron and 4 tablespoons of milk powder to this water. Apply this face pack on your face and let it sit there for 10 to 15 minutes and then wash with cold water. This face pack is sure to help to improve the texture of your facial skin. Soak 4-5 saffron strands into water for 1-2 hours. Next, massage your face gently for 5 minutes using this mixture. Now wash away using lukewarm water. Practise it 2-3 times a week for good results. Kesar can help you get rid of acne, pimples, blemishes, and even wrinkles as it is loaded with antifungal properties. Make a paste of 10 Zafraan strands and 6-7 basil leaves. Apply it on your face. Next, wash away after 10 minutes. The basil leaves in this face mask helps to clean the acne and pimple causing bacteria from the face. Saffron is a good source of Vitamin A, Vitamin B and Vitamin C. Massage your face for 15 minutes with Kesar milk to brighten and lighten your skin. You can also attain tan free skin with it. To brighten your skin tone you can Soak a few strands of saffron in milk for 2 hours. Apply this milk on your face and neck. Wash your face after a few minutes. Using this face pack daily will make your skin naturally fair. Another mix that you can prepare to get naturally fair skin is just soak the sunflower seeds (chironji) and saffron strands in milk overnight. Grind this mixture the next morning and apply it on your face to get fair and glowing skin. Zafraan is anti-inflammatory in nature. The various antioxidants present in this spice make it a potent tool for treating multiple skin conditions. The absorbing nature of the saffron enables it to hydrate the skin when applied to the skin. It is perfect for treating chapped and dried skin. Take 1 tbsp honey and soak 8 saffron strands in it. Next, massage your face using this mixture. Let it stay on your skin for 15 minutes. Wash off with lukewarm water and enjoy the treat of glowing and hydrated skin. Kesar contains a number of macro-micro nutrients including magnesium and potassium. The nutrients boost cell growth and repair damaged skin tissues. If you are looking to get radiant and smooth skin just make a face pack by mixing 1 teaspoon of sandalwood powder, 2 to 3 strands of saffron, and 2 tablespoons of milk. Wash your face and wipe it clean with a cloth before you apply this face mask. Apply this face mask on your face and massage your skin in a circular motion. Let the face mask dry for 20 minutes and then rinse off. Apply this mask once a week for the best results. To get rid of dull skin just add 2-3 strands of saffron to one teaspoon of water and let it sit aside for overnight. The next morning the color of the water should turn yellow. To this saffron water add one teaspoon milk, 2-3 drops of olive or coconut oil and a pinch of sugar to this saffron water. Using a piece of bread in this mixture, apply it all over your face. Allow this face mask to dry for 15 minutes and then wash it off. This face mask will work to freshen up your dull skin as well as help in getting rid of dark circles under the eyes. This mask also works to exfoliate your skin by helping blood circulation, thus making your skin smooth and glowing. For a luminous complexion just add a few strands of saffron to honey and massage your face with this face pack. This face pack stimulates blood circulation by providing oxygen to your facial skin. Using this face pack regularly will give you a glowing complexion. For ages saffron extracts have been used to treat wounds. Saffron is known to have some amazing healing properties which work in healing wounds and removing scars and spots for a blemish free skin tone.